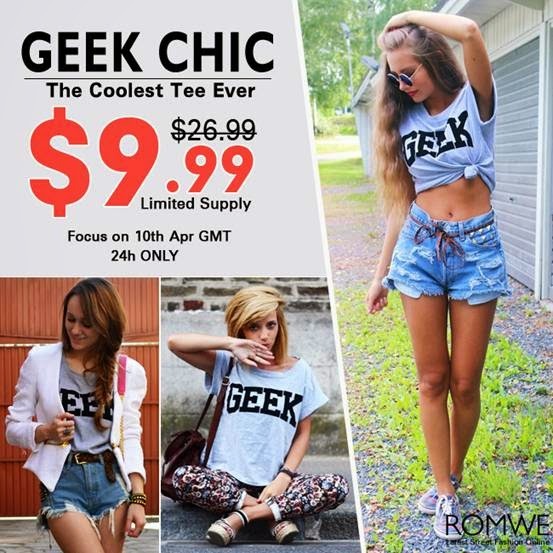 romwe geek shirt sale 63% off! Probably one of the most popular sought-after shirts of all time is the "geek" shirt. With people like Steve Jobbs, Mark Zucherberg and Bill Gates still high on the rise, it looks like geek chic is here to stay for a very long time. Nothing is quite as endearing as an "accidentally fashionable geek" look and now you can finally achieve the same style with ROMWE's geek shirt sale. Starting today, for just 24 hours, get to purchase this versatile GEEK shirt at 63% off for only $9.99! Original price was $26.99. Only limited stocks so best take advantage of the opportunity. You can check out the exclusive sale HERE.